The worst way to manage pagination is to do Insert > Page Break (Figure 1). This puts a “hard” page break in your document. It can sometimes get caught up in a heading or a cross-reference, which will break your table of contents or cross-references. And it makes it hard when you add or remove text above the page break and you have to move it. Most pagination options are found in the Paragraph dialog. To see the Paragraph dialog, on the Home tab, click the dialog launcher in the Paragraph group (Figure 2). You can control most pagination with the options on the Line and Page Breaks tab (Figure 3). Click in the earlier paragraph. 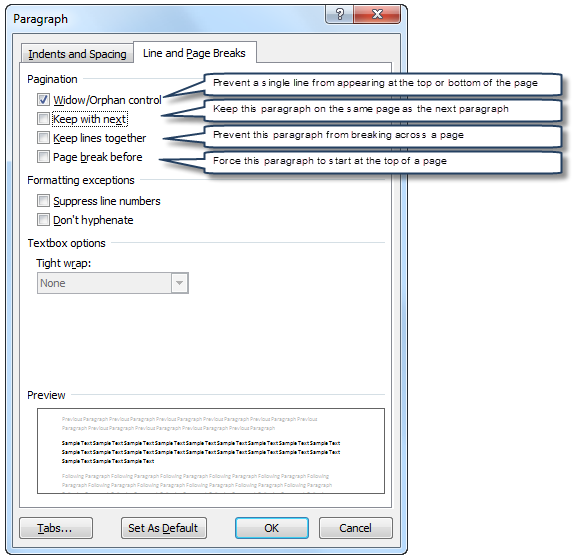 In the Paragraph dialog, on the Line and Page Breaks tab, choose “Keep with next”. This option translates as “Keep this paragraph on the same page as the next paragraph”. This option is ideal for paragraphs that introduce a bulleted list. In most templates, many styles are set to “Keep with next”. By default, all heading styles, for example, are set to “Keep with next”, so there will never be a page break immediately after a heading. If you apply “Keep with next” to too many paragraphs in a row, and if Word cannot fit all the material on one page, Word will eventually insert a page break. So only use “Keep with next” where you need it. Click in the paragraph. In the Paragraph dialog, on the Line and Page Breaks tab, tick the “Keep lines together” option. This translates as “Keep all the lines in this paragraph on the same page”. If you're using a well-constructed template, there should be little need for this. But very occasionally you may need to force a paragraph to start at the top of a page. Click in the paragraph. In the Paragraph dialog, on the Line and Page Breaks tab, tick the “Page Break before” option. This tells Word that you want to start this paragraph at the top of a page, no matter what. 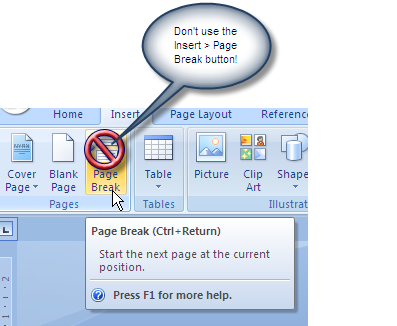 This method does not have the same poor side effects of forcing a page break as Insert > Page Break. Select all the table except the last row. In the Paragraph dialog, on the Line and Page Breaks tab, tick “Keep with next”. You can't prevent table rows breaking from the Paragraph dialog; you must set the table properties, not paragraph properties. Select the whole table. On the Table Tools Layout tab, click Properties. On the Row tab, un‑tick the “Allow row to break across pages” box. Adding individual buttons to the Quick Access Toolbar or to the ribbon provides an easy, one-click way to apply these settings. The Keep with next button even shows you the status of the currently selected paragraph. I now routinely put that button on the Quick Access Toolbar, next to the Styles combo box. 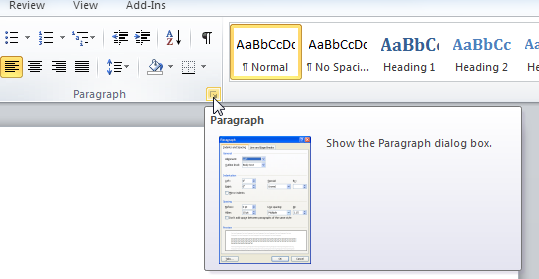 Figure 4 shows what this looks like in Word 2007.